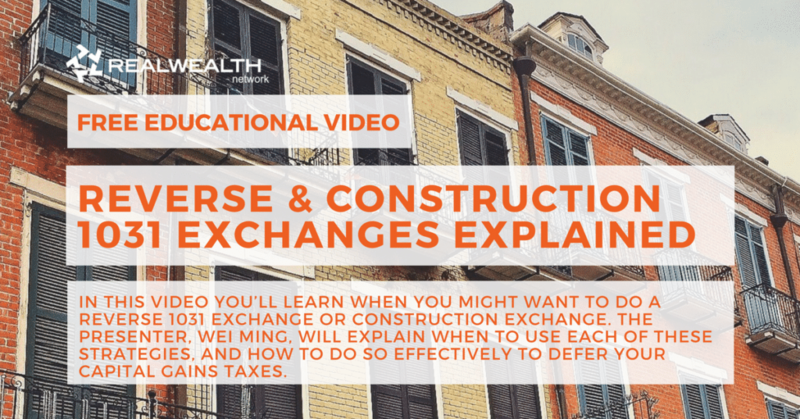 In this video you’ll learn when you might want to do a reverse 1031 exchange or construction exchange. The presenter, Wei Ming, will explain when to use each of these strategies, and how to do so effectively to defer your capital gains taxes. Wei Ming: Now next we have the reverse exchange. Again, this is one of the exchanges that are much more complicated to execute. Not all 1031 exchange companies offer these. But why do you want to do a reverse exchange? Well, maybe you found a property you really, really like, and you know it’s not going to be on the market for very long. You would want to execute and reverse exchange to buy the property first because a reverse exchange allows you to buy it first and then sell your property later. Also gives you a peace of mind knowing that you already have your replacement property. If you know for sure you’ll relinquish property, it’s going to sell fairly quickly, maybe you want to execute a reverse exchange to get the property you want first. Why won’t banks loan on it? Well, banks aren’t going to give you money so an LLC can take title through replacement property. Unless you have it all cash or if you’re willing to get a hard money loan, reverse exchanges are going to be difficult to execute. Here’s how it works. Create the LLC, LLC takes title, the client will operate the property under a triple net lease agreement. What that means is if the property has a tenant in it or it’s generating income somehow, the client gets that. Any expenses, clients will pay it. So you wouldn’t have to worry about what if this property was getting income, the income will go to the client. Relinquished property has to sell in 180 days from the close of escrow on the replacement property, so it’s a complete opposite of the standard exchange. Property sells, and your taxes are deferred. As simple as that. The LLC is then transferred to the client and exchange is complete. What happens if you fail to sell your relinquished property. Well, you are now the proud owner of two properties. Whether or not you want to own both properties, you now own two properties. There are no tax consequences because you haven’t sold anything but now you own two properties. Congratulations. The final type of exchange available to investors is the improvement or construction exchange. Now, this one is set up similar to a reverse exchange in that we create an LLC. The reason for creating an LLC is the client cannot be on title to the property while it’s being improved upon through a 1031 exchange, that’s why we create the LLC. We create the LLC, LLC takes title to the property, and the accommodator will hold your funds. It is up to the client to find workers to work on the property or to build upon the property. It’s up to the client. Workers will bill the client, the client will authorize us to pay the workers. You have 180 days to spend the funds. If it’s past 180 and there’s funds left over, we’ll wire that back to you and you pay taxes on whatever’s left over. The construction doesn’t have to be completed in 180 days, you simply have to spend the funds in 180 days. Now, some of you were thinking, “Hey, you may be able to pay somebody up front.” I don’t know if you want to pay a contractor all that money upfront. What if you do it for yourself? Unfortunately, that can’t happen. You can’t pay yourself to work on your own property. You may charge yourself a couple of $1000 an hour because you guys you’re time’s worth it. Unfortunately, you cannot bill yourself or pay yourself for the hours you spend working on the property yourself or you cannot use your own construction company. It has to be a third-party. Now, whether or not they’re licensed company, a third-party company working on it, it’s up to you. We don’t come knocking, we don’t check. Finding your workers is up to the client. Once the funds are spent within 180 days, we’ll transfer the LLC to the client. There’s still funds leftover again, we transfer the funds back to the client, whatever is remaining, and we’ll also transfer the LLC regardless back to the client. RWN Member: What is the transfer fee from the LLC back to the client? Wei Ming: There’s no secondary transfer fee from a LLC to a client because we’re not transferring real estate property to the client. We’re transferring LLC to the client. Using the LLC, that usually avoids a duplicate transfer tax, and that’s usually a majority of the time maybe a little different depending on the county. Different counties, different rules, so check with your CPA or tax advisor, but generally, avoid the duplicate transfer tax. Those are the four types of exchanges available to investors. Simultaneous exchange, where you can close on the same day; delayed exchange, where you sell first and have 180 days to buy; reverse exchange, where you buy first and have 180 days to sell; or the construction exchange, which lets you use any remaining funds to improve on your property. The heirs will inherit your property and they will not have to pay back the deferred taxes that you’ve been deferring all these number of years. The kids won’t have to pay back any of it. It dies with you. Not only that, when your kids inherit your property from you, they will step up in a fair market value on your properties. If they were to sell the property at what they inherited for, say the next day, hopefully not the next day. They would have zero capital gain, and they pretty much pocket everything. Well, you probably won’t enjoy much as heirs, but at least, you didn’t know that they would not have to pay that back, and they’re set up a little better. That is the best part about the 1031 Exchange. The deferred taxes die with you. Ready to do your 1031 exchange? Schedule a Free 1031 Exchange Strategy Session Today. We can help you find replacement properties and much more! How To Calculate Capital Gains Tax on Real Estate Investment Property? Weiming Peng is a key part of the sales and marketing team at Asset Exchange Company. Mr. Peng travels throughout Northern California educating the real estate industry on the benefits of 1031 Exchange. Mr. Peng has presented his 1031 Exchange seminars at numerous, real estate brokerages, real estate associations and networking groups including, but not limited to, the Oakland Association of Realtors, the San Mateo Association of Realtors, the Santa Clara Association of Realtors, CCIM, Chinese Real Estate Association of America and the Real Wealth Network. ​ Mr. Peng is fluent in English, Cantonese and Mandarin and plays an important role in guiding our clients through the complexities of the 1031 Exchange process. Mr. Peng is graduate of the University of California at Santa Cruz and holds a BA degree in Business Management and a minor in Legal Studies. In pursuit of his Business Management degree, he trained extensively in coursework involving U.S. economic analysis, financial analysis, marketing, and accounting.